opportunity to attend any of the events we held throughout the year to both celebrate our milestone and raise funds for local nonprofit organizations, mark your calendar for Sunday, November 3! 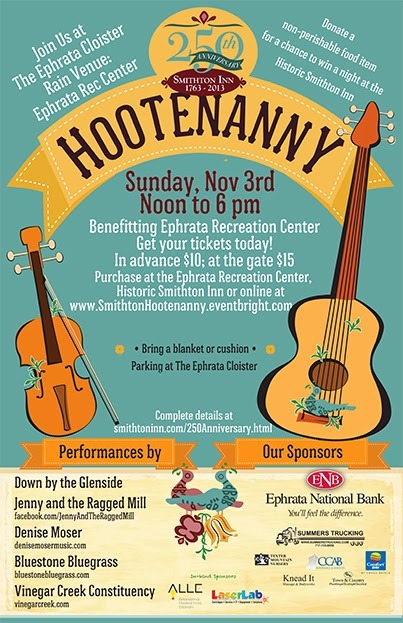 The Historic Smithton Inn Hootenanny Awaits You! Proceeds from the event will benefit the Ephrata Recreation Center. Besides your love of exceptional music and sense of fun, bring a blanket so you can relax on the lawn or add some cushion to the benches at the Cloister (chairs not allowed because they will block the view of others). And don’t forget your appetite! You’ll find plenty of food and beverages available for purchase from local vendors & non-profits. If you’re so inclined, also bring a non-perishable food item to donate to our area food shelter. Not only will you be doing a good deed, you’ll also be entered for a chance to win a FREE night’s stay at the Historic Smithton Inn! Tickets are available for just $10 in advance or $15 at the door. You can purchase them online at Eventbright, at the Historic Smithton Inn, or at the Ephrata Recreation Center. I hope you’ll join me on Nov. 3! This event supports a wonderful community resource and will be an unforgettable day of amazing music and camaraderie.